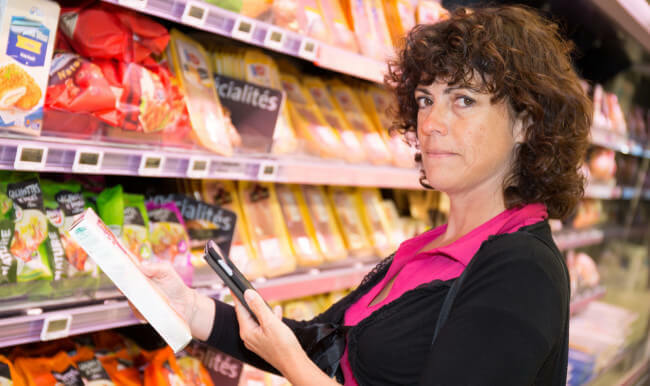 From yellow stickers to rotating discounts and cashback apps – if you do the right things, you could save A LOT of money at the supermarket. 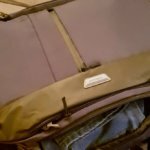 Here are the tricks I use. 1. Always Make A Shopping List – And Follow It! This is such a simple rule, but so many people ignore it. Either they don’t make a list at all – or they do, but end up buying countless items there were NOT on the list. Remember – when you make the list, you’re at home (or at work) where it’s calm and quiet, and you can decide what you REALLY need to buy. When you’re already at the supermarket, it’s easy to get tempted and buy stuff you don’t need. If you make a list and STICK TO IT, you’re going to save money. In addition to making a list, you should also decide on a fixed budget for your weekly shop. Some even use cash in envelopes, to make it easier to actually “see” how much money you have left for your grocery shopping. So, let’s say you allocate £40 for your weekly shop. You have your list, but you find out that if you buy everything on the list, you’ll end up paying £50. What do you do? You take stuff out of the trolley. That sounds like blasphemy, I know… but it’s the only way to make sure you actually stick to your shopping budget. So OK, you planned on eating frozen pizza this week, and instead, you’ll eat more rice. That’s OK, it really is! Because your “prize” is that you saved money by being a responsible shopper with a strict budget. Making a shopping list is important, but how would you know what to PUT on that shopping list? Sit down at the end of the week, and plan what you’re going to eat during the next week. Yes, that means every day, breakfast, lunch and dinner. Then, check your kitchen and see what ingredients you’re missing and what you need to buy – and add the stuff you need to the list (and ONLY the stuff you need). I find that when we don’t plan ahead, we always buy more food than we actually need, and end up freezing unnecessary products, or even worse – throw away food that goes bad because we didn’t have time to actually eat it. If you have no choice, and you DO end up hungry at the supermarket, you need to decide right there and then what your next meal is going to be (assuming you don’t have it planned already), and ONLY buy the stuff you need for that meal. Other than that – buy things from your list, and don’t get tempted. When I go to the supermarket without a list (and sometimes even when I DO have a list), I tend to walk through ALL the aisles. I want to see what’s new, plus I think it might jog my memory and remind me to buy more stuff I forgot about. Well… that’s a bad idea, money-wise. 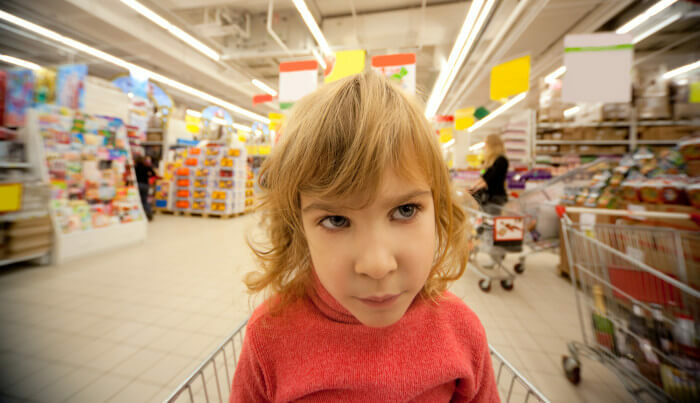 If you have a list, and there are no crisps on the list this week, why would you go into the crisps-and-snacks aisle? You’re bound to buy SOMETHING if you go in there (well, it’s crisps for me… for you it might be the sweets and chocolate aisle). Why even tempt yourself? If it’s not on the list – don’t get near it. It might sound silly, but that helps with the costs as well. If you take the time to check the prices, the deals, and the products – you’re more likely to buy cheaper stuff. And you’re more likely to follow your shopping list, and think twice about any temptations. Many products come in varying shapes and sizes. And to add to the confusion, the boxes often look roughly the same size – but have different amounts in them, which makes it harder to compare prices. Luckily, in the UK, supermarkets are bound the show the price per 100g (or per 1kg), and on some products, the price-per-unit. But the fact that the information is there (and usually in very small print), isn’t enough – you need to actually read it and use it. You’ll often find that even when a product is “On Sale”, the price-per-100g, when compared to a different product (which might not even be on sale) might come up more expensive than the other one. This one is related to #7, but in a different way – sometimes products look very similar, and might even look cheaper – but when you take a closer look, you’ll see you’re getting LESS than you thought. Let’s take Kitchen Rolls (also known as Paper Towels) as an example. 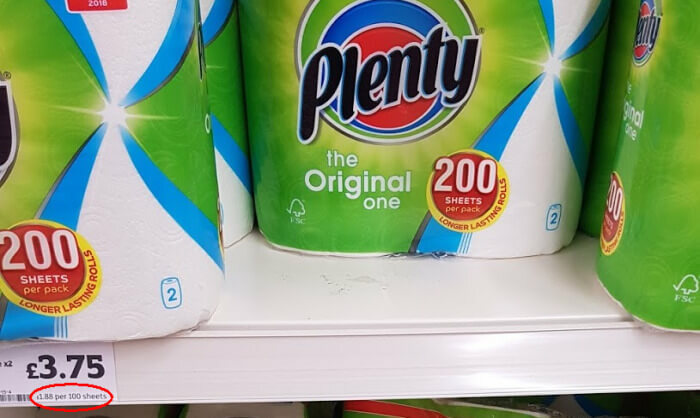 You might see two seemingly identical products on the shelf – a pack of two kitchen rolls, one costs £1 and the other – £1.5. At this point, you would assume the cheaper one is best, right? Not necessarily. Upon close examination, you might see that the £1 one only has 50 sheets on each roll. While the second one has 100 sheets per roll. The same goes for toilet paper – rolls that look roughly the same, often have very different numbers of sheets in them. Usually, the number of sheets is specified on the pack – so use that to compare the REAL cost. But if you take a moment to look at the lower (or upper) shelves, you might find some real bargains – products that serve the same purpose, but cost less. Most big supermarkets have a “World Foods” section, with products from India, China, South Africa and more. While it’s a good place to discover interesting new foods, it’s also a place to find some bargains. Sometimes, the same exact product (possibly from a different manufacturer), will be sold for much less at the World Foods section than at a different section of the supermarket. Let’s take Gram Flour for example – which is flour made up of Yellow Split Peas and Chick Peas (and is particularly useful for Gluten Free cooking). At Sainsbury’s, it costs £1.40 for 1kg at the World Foods section. However, a similar Gram Flour over at the Gluten Free section – costs £1.75/kg. When food products reach their “Best-By” date, supermarkets try to sell them at a reduced price. Sometimes you’ll find a discount of 30%-40% if there are only a few days left, and sometimes, if you find something on the actual last day of its Best-By date, the discount might even reach 90%. Finding those reduced items isn’t always easy, though. Some supermarkets tend to “hide” those products. Still, the best time to find reduced food products is when the store is about to close – so late in the evening on weekdays, or in the afternoon on Sundays. Remember, though, to handle those reduced food items appropriately. If you’re going to eat them today – that’s great. If not, make sure you freeze them right when you get home, so you can still eat them at a later date. OK, So we’re not all great chefs, and we don’t all have husbands who know to cook everything (lucky me). But still – you could save A LOT of money by preparing at least some of the food yourself, instead of buying Ready-Made TV dinners. Take a simple thing like rice, for example: Uncle Ben’s Microwave Basmati Rice 250g currently costs, at Tesco, £1.49, so £5.96/kg. So start learning how to cook – even the most basic stuff – it’ll save you loads of money. I go crazy when I see how much people spend on food when they’re at work. Sure, going out with your colleagues for lunch every once in a while can be fun – but doing it every day? that’s crazy. Of course, cooking for yourself and bringing it with you is the best – and cheapest option (See #12). But EVEN if you buy supermarket ready-meals, that’s still so much cheaper than eating out at a restaurant or ordering food delivery. The same goes for drinks, by the way – even if you don’t drink water, and insist on Diet Coke or something similar – buying a large bottle at the supermarket is so much cheaper than buying a can every day. There are several cashback apps out there that offer you money back on your grocery shopping. I mainly use GreenJinn (which works with Tesco, Sainsbury’s, Iceland and Waitrose) and Shopmium (Tesco, Sainsbury’s, ASDA, Waitrose and Morrisons). On Shopmium, use my promo code – KYFCFGMU – to get an extra bonus. Get it here. These apps have a rotating selection of products that you can buy at the supermarket, scan the receipt, and get some of the money you paid back (usually via PayPal). 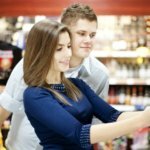 The products on offer are sometimes new or obscure (which is part of the point – getting you to try new products), so it’s important to only buy things you actually NEED, otherwise you’re spending MORE money instead of spending less. It might sound strange, but there are companies that pay you to scan your receipts. 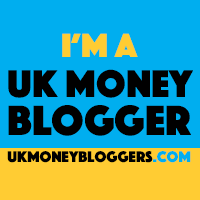 They use that information for market research, and personally, I’m not bothered by that too much – so if you want to earn a little more – just from those supermarket receipts – check out my full Shoppix review here. There are so many grocery discount coupons out there – it’s just a matter of finding the right ones. You then print the voucher (or, in some cases, can show it on your phone), and get a discount at the supermarket. Money Saving Expert’s supermarket coupons page is a good place to start. The big brands spend millions every year on advertising – just to convince you their products are better. But that’s hardly ever the case – there are many product lines where the less-known brands are just as good (if not better) than the big brands – and are usually much cheaper. Additionally, supermarkets have their own private-label brands for a lot of products and food items these days (sometimes, those products are even manufactured by the same factories that make the known-brands). The private-label brands are, usually, cheaper than the other brands – so at the very least you should give them a try. Most supermarkets with private-label products, divide their products across two or three levels of “quality” and price: Basic/Value, Regular and Premium. The Basic/Value products are always cheaper. So yes, sometimes they’re of lower quality, but always give them a try, at least – because even that “lower quality” can still present excellent value for money. For example, I always buy Sainsbury’s Basic Kitchen Roll – the paper towels are not as thick as the other brands – but they’re so cheap (half the price! ), that even if I occasionally have to use two towels, they’re still better value. 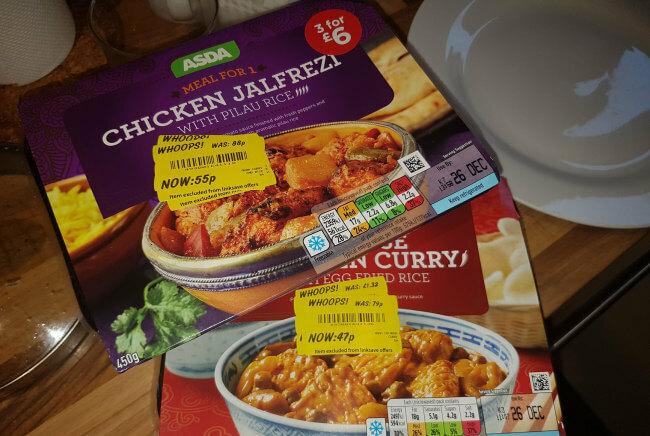 Supermarkets love putting things on sale – it helps you feel like you’re getting a bargain, and it keeps you coming back, because you’re always wondering what will be on sale this week. Here’s a little secret – the big supermarket chains have product categories that have ever-revolving chain of sales and discounts. Take Diet Coke, for example – you can always be sure one or two of the bottle sizes will be on sale. So if the 2litre bottles are on sale this week – then in two weeks, the 1litre bottles will be on sale instead. And it works that way with yogurt brands… and tuna brands… and, well – almost every category. So if there’s a product you regularly buy, and it’s not on sale at the moment – there’s a very good chance it WILL be when the supermarket does its rotation again, in a week or two. However, you need to be careful with sales and discounts. Sometimes, even after the discount, the product will be cheaper in a different store. And even if the price is good – you should still only buy things you actually need. And while I do occasionally stock up on things I buy regularly, when they’re on sale – there’s no point in buying 30 cans of tuna in advance, which is practically like giving the supermarket a line of credit. 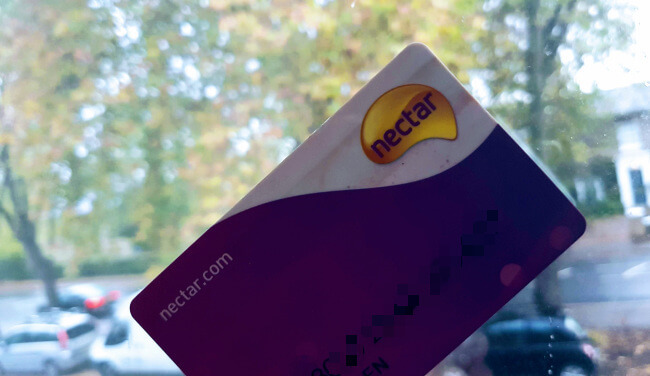 Sainsbury’s have Nectar (where it’s confusing to earn points), Tesco have their Club Card (where it’s confusing to redeem points) – but even if it’s a bit of a hassle to take advantage of, it’s still a good deal to use those loyalty cards. Basically, you get points, and can then redeem those points at the supermarket or in other businesses. Using Nectar points, I already got – for free – pots and pans, a fan, a food mixer, and even a vinyl record player… so there’s no reason not to use these cards and score some extra discounts and free products. Some supermarkets work hard on trying to tempt you to buy some more near the checkout lines. They’ll put chocolates, snacks and “special deals” there… And that’s especially risky when there’s a queue, and you’re bored, and you start looking around. Whether you’re using the self-checkout, or the regular till, make sure you check the actual prices you paid on the receipt. Supermarkets make a lot of mistakes – and often, you’ll see one price on the shelf and another (usually higher) at the till. Don’t give up on those! Go to the Customer Service desk, show them the receipt, and let them know there was a different price on the shelf. In most cases, you’ll get the difference back. 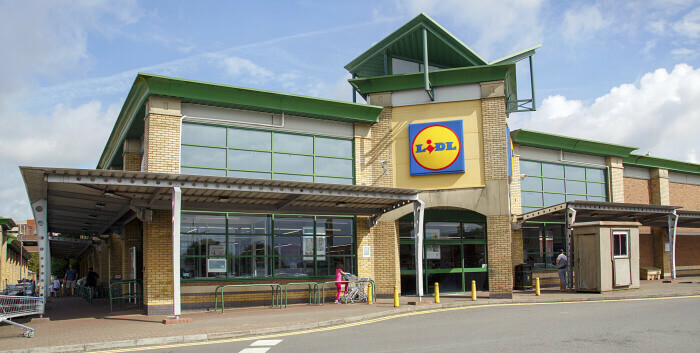 The two Germain chains, Aldi and Lidl, are gaining are a lot of popularity in the UK, and for good reason – they’re usually cheaper than the “big chains” – especially if you compare whole baskets and not just a single product. While it’s true that the range of products that Aldi and Lidl offer is smaller than the range in Tesco or Sainsbury’s, you can still find most of your weekly needs there – and you’ll be saving a lot of money. It’s easier than ever to compare supermarket prices these days, with apps like MySupermarket. With sales and prices that change every day, you’ll often find that you can make the biggest savings by splitting your weekly shop among different supermarkets. 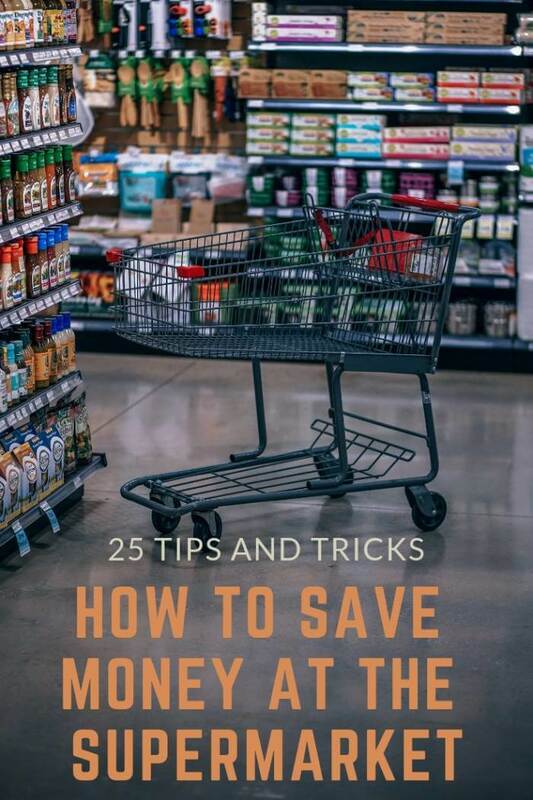 So, you can still buy most of your groceries at one store – and then, on another day, go to another store to buy those specific items that you know will be cheaper there. For example, I usually go to Sainsbury’s to buy my Gluten Free products – and then go to a nearby Iceland to buy meat, canned tuna, and other products that are usually cheaper there. This one might sound a bit counterintuitive when you’re trying to save money – but it’s an important one. Try to always allocate a small part of your available supermarket budget to some self-indulgence. Depending on your income and spending, this can just be £1, or £10, that’s up to you – but set the amount in advance, and then – you’re “allowed” to use that allowance for WHATEVER you want at the supermarket. Surprise yourself… get a bar of chocolate. Buy those Christmas mince pies two months before Christmas. Buy a silly magazine as your guilty pleasure. When you have that small amount of “free spending money”, it not only makes you feel good – but it also prevents you from spending MORE money and spoiling yourself with other things. If you don’t set that budget in advance, you might keep thinking “I need to buy something good for myself! I deserve it!” – and then you buy 10 things and spend £50 on them. But when you know you can pick one or two things for yourself, and that it’s OK – you have a better chance of sticking to those things, and those things alone.